Gaelle Enganamouit, star of the Cameroon women's side, has opened the nation's first football academy for girls. 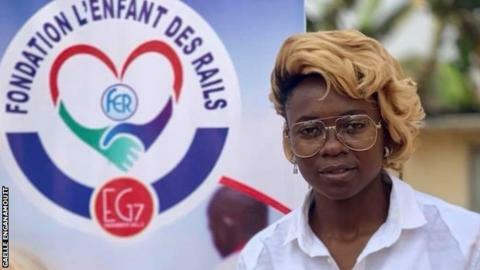 Her Rails Football Academy is named after the deprived Yaounde area she grew up in called 'Railway'. "I will start with my money and support from sponsors but the problem is not money, but training," the 2015 African Player of the Year told BBC Sport. "I will give everything to train my younger sisters and to help them grow." Enganamouit, who now plays in Norway for Avaldsnes IL, is determined to help open doors for others from a similar background, she has support from Cameroon National Football Academy the country's football federation. "My motivation is my background. I may be a big player now, but all know I am from the 'Railway', and things were not easy for me," she explained. "That is why with the opportunity I have today, I have decided to help others." She added that this is a project she holds close to her heart and she will do everything to make it work. The academy in Yaounde, which was officially opened on Friday, intends to recruit 18 players in each of three categories under-8, under-13 and under-17. Unlike some other academies the girls will not be expected to make any contribution at all to their training and education. Enganamouit already has plans for the future. "We are starting in Yaoundé, but we are calling on the players from the other regions to be patient for the academy will in future include you," she insisted. The first set of players for the academy will start by continuing to live at home while going to school and training at the academy but in the long term the plan is for the students to live on site. The academy is the latest step on Enganamouit's journey to help young girls in Cameroon after starting the Fondation des Enfants des Rails in 2016 which organises an annual football events for girls in during the festive period.